Our faith lights up the world. And each person is a child of God. Our life proclaims the Gospel. We live His Word, we bless and we heal. Shepherd News Trust is a group of pilgrims. We are children of God, just like you are a Child of God! We believe in the diversity of faith traditions for the purity of faith. We further believe that God has ordained spiritual unity through diversity. As pilgrims we witness to the Word of God, and his presence in the world by the power of the Holy Spirit. We invite all Christians, Jews, Muslims and the diversity of the world religions to join us in this unity through diversity to live in harmony and peace. We have formed the Shepherd News Trust in 1985 to bring the Word of God by the power of the Holy Spirit to all people in the world. We publish and distribute inspirational books on contemporary issues of faith, ethics and peace. We are committed to improving the quality of life for individuals and families. 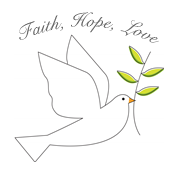 The Shepherd News Trust logo symbolizes the quality of our inspirational writings. Christ is the Shepherd. The N represents His news as Gospel Truth and the T confirms faith in God as enduring trust. Connecting the N and T is the Shepherd's rod. If you were going to approach Jesus with your problems, what would He do? We are His hands in the community. Our mission is to help people address issues concerning their jobs, or school, or relationships, both family and other relationships. It is people helping people to make the world a better place.